The Narragansetts were a large and warlike people, and hard fighters. Their country covered nearly all present Rhode Island; the city of Providence was founded in their midst, when the great preacher Roger Williams sought refuge among them. They conquered other tribes to the north and west. When Metacom (King Philip) rose in 1675 they numbered, of themselves, five thousand people, and could put into the field two thousand warriors. Canonchet stood firm. To his notion, he was not obliged to surrender anybody, while the English held his brother and three other Narragansetts. Besides�"Deliver the Indians of Philip? No! Not the paring of a Wampanoag's nail!" On March 26, which was a Sunday, Captain Peirse saw upon the other side of the river a party of Indians limping as if worn out and trying to get away. Therefore he crossed, near the Pawtucket Falls, in glad pursuit�and "no sooner was he upon the western side, than the warriors of Nanuntenoo, like an avalanche from a mountain, rushed down upon him; nor striving for coverts from which to fight, more than their foes, fought them face to face with the most determined bravery!" 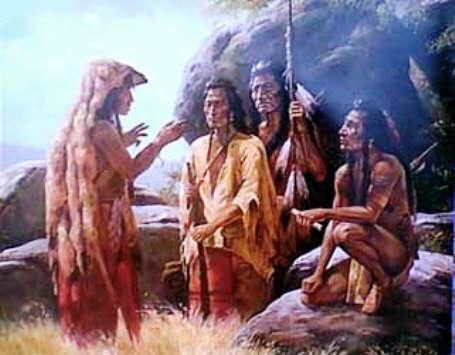 He did not know that now the enemy were upon his trail indeed; but at the moment a company of fifty English under Captain George Denison of Southerton, Connecticut, and eighty Indians�the Mohegans led by Chief Oneka, son of Uncas, the Pequots by Cas-sasin-na-mon, the Niantics (formerly allies of the Narragansetts) by Cat-a-pa-zet�were drawing near. However, he was out-footing all except one Indian. That Indian was a Pequot named Monopoide�the best runner of all, and better than Canonchet himself.